In celebration of its 50th Anniversary of football cards, Topps continues with its season-long "Turn Back The Clock" Card of the Week program. 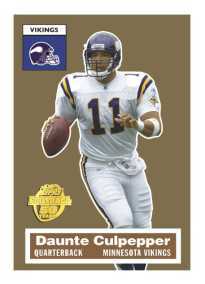 This week's featured player is Vikings Quarterback Daunte Culpepper. So far, nine of the 22 cards have been issued. Each and every week, hobby shops will have one brand new 50th Anniversary football card from the special 22-card set and each card is free with purchase of any 2005 Topps Football product.